The below provides an overview of how to join in and create a Flock of your own. For schools there is also a new education resource that can be used to assist teachers with information about the birds. Contact the Shorebird Centre to find out more. Because these birds have long beaks that can be quite fine, like the kuaka (bar-tailed godwit), a material that is strong in all directions is needed. It also needs to be reasonably weather-proof to survive outside for an extended period. Another requirement is that it be free or at least very cheap. Re-cycled three ply sheet works very well. Shower-board off-cuts are strong and water resistant. Real estate agents sign board (Corflute) is a strong light-weight material available in some dump shops and from real estate agents. Wooden stakes are going to take the place of legs for our model birds and can be produced by running old nail-free timber through a bench saw. Each stake should be knot free so that it doesn’t break when placed in the ground. Attaching stakes to the model. For the heavier materials construction adhesive applied with a “grunge gun” works well. Screws are an alternative. Long paper staples are all that is needed for Corflute. 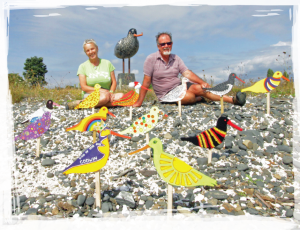 Download here The Flock: Cut-out Shorebird Patterns PDF file. This contains templates to cut out the shapes for four bird species – the kuaka (bar-tailed godwit), huahou (red knot), tōrea (South Island pied oystercatcher) and ngutuparore (wrybill). Printing the file at the A3 size provides slightly over-sized bird outlines for use to create cut-out shapes. 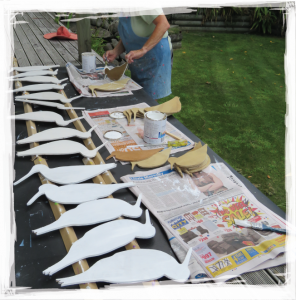 A pre-cut template set is also held at the Shorebird Centre, Pūkorokoro Miranda and you can trace around these to get your own template set. Glueing the paper copy to stiff card will give a more durable template. Cutting out the templates from any of the materials mentioned is not an activity for children. Even the Corflute is hard work using scissors or a craft knife. A band-saw works well and it takes only five minutes or so to produce a cut-out. A jigsaw is another possibility. 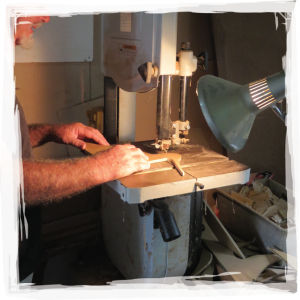 A hand operated fret-saw might be quite time consuming and inaccurate in the hands of an inexperienced person. Multiple copies are possible with a laser cutter. If you would like the files we have for this please contact the Shorebird Centre to find out more. A white primer or undercoat would give a good base for decorating a bird with paint and would be protective, but it is not essential. It is not needed for the shower-lining, particularly if it is to be coloured in with permanent marker. Corflute is white on the back but does take paint if you need to decorate the other side. As above, Wooden stakes are going to take the place of legs for our model birds and can be produced by running old nail-free timber through a bench saw. Each stake should be knot free so that it doesn’t break when placed in the ground. For the heavier materials construction adhesive applied with a “grunge gun” works well. Screws are an alternative. Long paper staples are all that is needed for Corflute. Avoid applying too much force to get these “birds” into the ground. Avoid using a hammer. Preparing a hole with a sharp spade, dropping the staked bird in and firming with a foot works well. The longer legged kuaka or bar-tailed godwits need a longer stake. Find a safe grassy or shelly spot where the birds will be supported and be publicly viewable for some time. Signage options will be supplied in future to go with your flock. Invite your community to get involved and continue to add to your local flock of birdly creations. We plan to help coordinate some migrating of flocks local to Pūkorokoro Miranda, and we will be encouraging others to do the same in their areas. Get imaginative with how you might coordinate with others to build your flocks! There might be seasonal migrations that accumulate in a particular spot in an area – or mini-flocks that decided to either stay in one place and grow all season, or continuously wander till September. Up to you!